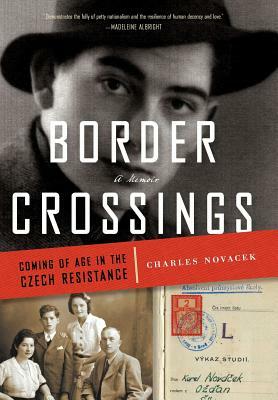 Border Crossings: Coming of Age in the Czech Resistance is the captivating, tender memoir of Charles Novacek, a Czechoslovakian whose idyllic childhood exploring the Tatra Mountains was shattered by the Nazi occupation of his homeland. He spent his youth defending his neighbors, his family, and his country, first from the Nazi atrocities of World War II and then from the Soviet oppression of the ensuing Cold War. Charles was eleven years old when his father and uncle recruited him into the Czech Resistance. Antonin Novacek not only taught his son to survive in the wild, but also prepared him for wartime: how to resist pain, hunger, and fear and to trust no one. His assignments included delivering messages to soldiers parachuting behind enemy lines and hiding them in caves he equipped for their shelter. As a young man, Charles was captured and jailed by the Communists and rescued by an underground resistance network. In too much danger to remain in Czechoslovakia, he staged a daring escape only to land in a miserable displaced persons camp. His will to live prevailed once again, and Charles eventually married and built a successful life in America. Filled with heroic adventures and great bravery, Border Crossings is one man's remarkable tale of his incredible life and a testament to the human capacity to survive.